Blog My Gleanings posted a translation into English of Astruc’s 1948 article on 23 October 2003. Digital Video and Alexandre Astruc’s Caméra-stylo: The New Avant-garde in Documentary Realized? Studies in Documentary Film 2, no. 1 (March 2008): 47-59. Bjørn Sørenssen. This is one for everyone [BBC TV re-views in iPlayer only for UK citizens/radio programmes for the world]. A one-hour programme broadcast Tuesday 19 January 2010. Next programme: Tuesday 26 January 2010. This post is here for a devious reason: once you have read the post on film essays and cinema/media stylo that isn’t yet ready for posting, you will be able to refer here for examples of film clips on radio. While trying to write posts on film essays and camera-stylo this is a classic displacement activity. Remember the animal behaviour text books: the three-spined stickleback males have distinct territories. When they confront each other right on the dividing line between each other’s territory in a fish tank, they cannot attack but dip downwards. Watching The Tall men [Raoul Walsh,1955] starring Clarke Gable, Jane Russell and Robert Ryan on Film4 this week, with half and eye and a third of an ear, it was pleasing to note a classic piece of cutting on the action involving Clarke Gable closing a door, turning through 90 degrees in order to be facing Jayne Russell opening a door to enter the room. I am not sure if that was three cuts or two (i.e. the door shutting and the turning as cuts or a single shot), but it all looked just right. The other day I saw another film in which a similar scene looked all wrong – name escapes me. Close up of face looking left, jump cut to close up of same face looking right, in order that another element of the scene could be introduced. The left-right-two-faces-looking-at-each-other felt wrong, let alone looked wrong, just because he wasn’t re-arranged pointing in the right direction. No different from a few notes in a piece of music which shouldn’t be there. How is it that one off note stands out like that? That’s how the brain is made: it notices little differences. (Though it also well-attested in all good psychology text books that men in bearskins can walk across the hotel foyer and not be noticed) That’s why it can see the difference between those paired cartoons, where something has been deliberately left out on one of the pair of seemingly identical pictures. I suspect the reason the cutting on action failed in this case is because a decision was made not to go back to shot[s] they needed to re-film to to make it right*: something that the editor will have seen very quickly and have to tell the director about. It’s not always general incompetence but necessary expediency. Often true for continuity: they know the hair’s not the same length but no one dare ask for the money to re-film it. * O.k., how many of you noticed the ‘to to’ mistake? “I saw a Rohmer film once…”: The truth behind the Night Moves meme, 11 January 2010. And, yes, I saw Night Moves and loved it. It was on British TV again not too long ago. You know that feeling of pleasure when you only realise a bit in to a film [been on a while, missed the beginning….] that you have seen it before – and suddenly remember how much you enjoyed it the first time. ……But I wasn’t incensed by “Night Moves” so much as annoyed by those who picked up the line and waved it about as their only response to Rohmer’s passing. Lighten up Jaime – or should that be Jamie (J’aime?) This is Jaime’s Rohmer post. Jaime claims to have started up the Night Moves/Rohmer meme in Twitter. What did you do that for Jaime? Twitter to me is not – of course it’s not – where one watches paint drying but examines someone picking a scab when already told by everyone to stop or else there will be a scar. If you have a pithy clever comment about something or someone write a blog post, for Chris’s sake and let it go. Someone will find it one day. 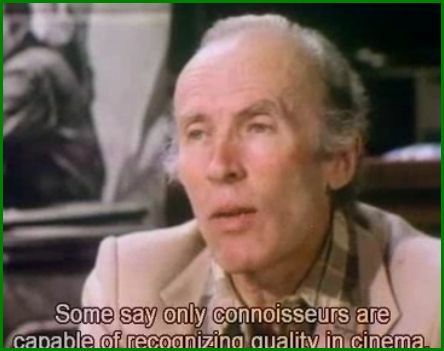 Although I feel I fall between the two camps – not an ordinary viewer: neither a connoisseur in the fullest sense of the term – I can appreciate a film like Bresson’s Au Hazard Bathazar but not have a comfortable viewing experience because of the use of amateur actors. This is how I feel about the feel of many of Rohmer’s films. 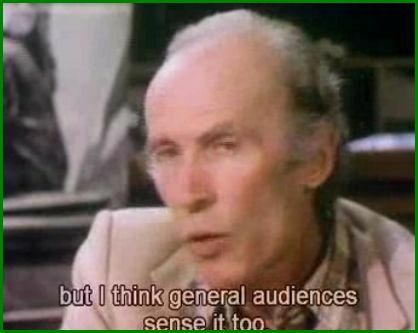 There is a contradiction which I have not resolved: Rohmer talks of the difference between making a film about a recent news events (which he is not interested in) and his type of film which is always a conversation. And yet his films are staged and acted to seem like a slice-of-life, with the ennuies and imbecilities, when they are fictions acted in the most part my professional actors. The design of Rohmer’s films are much as if one were to be pulled by the hand to a certain spot on the corner of a street in some town or other to watch something. The fact that the medium is film is only important in that there is this marvellous reproducibility: everyone can be dragged to that street corner. You can’t do that with a book. Well, you can, but not as well.